Six Day War | لماذا غزة؟ Why Gaza? A half-century after the Six-Day War which culminated in Israel’s occupation of the West Bank, East Jerusalem and the Gaza Strip, it is extremely disappointing that the U.S. Senate continues to succumb to Israel’s revisionist history (propaganda). Your support for S.Res.176, A Resolution Commemorating the 50th Anniversary of the Reunification of Jerusalem, along with your colleagues, is further evidence that the American Israeli Public Affairs Committee (AIPAC) may achieve by unilateral and incremental steps, what Israel failed to do in 1967-1968. The Palestinians consider East Jerusalem the capital of their future state. The United Nations, the vast majority of countries, and international law, support this interpretation of history. Your resolution does violence to the truth and to international law. Israel never “reunified” Jerusalem, as your resolution proclaims, but occupied East Jerusalem and then began drawing municipal borders to strengthen Israel’s sovereignty over the city by creating a Jewish majority. The legal status of the City of Jerusalem is clear. Under international law, Israel occupies East Jerusalem. S.Res.176 fails to mention the occupation and the Palestinians living in East Jerusalem who are not even granted citizenship in Israel but rather permanent resident status. In a precedent-setting case, the Supreme Court of Israel ruled earlier this year that the permanent residents of East Jerusalem deserve better. Last year I visited East Jerusalem. It’s like night and day between the Jewish settlements and the Palestinian neighborhoods. One has green lawns and swimming pools while the other struggles to live on about half the amount of water recommended by the World Health Organization. One has new schools and playgrounds with equipment for their children, while the other hasn’t had any new classrooms built in many years. Mothers are now holding classes in their homes. The State of Israel has been creating its “facts on the ground,” moving Jewish settlers into East Jerusalem and forcibly displacing Palestinian families out of East Jerusalem. I encourage you and your staff to watch these two short amateur videos about life in East Jerusalem. In the first, an Israeli activist talks about why she supports the Palestinians in East Jerusalem. In the second, children show how settlers have taken over the front part of their home, and the family continues to live in the back. Other families were thrown out into the street. Israeli, international and Palestinian activists, Sara Benninga among them, have started a growing solidarity movement and demonstrate there weekly to oppose the injustice of Israel accepting pre-1948 ownership claims by Jews, but not by Palestinians. S.Res.176 reaffirms that it is the longstanding, bipartisan policy of the United States Government that the permanent status of Jerusalem remains a matter to be decided between the parties through final status negotiations towards a two-state solution; and yet the very title and preamble clauses state unambiguously that Jerusalem is undivided and belongs to Israel, with no mention of Palestinians and their aspirations for East Jerusalem. Words matter! Even nonbinding resolutions matter! Please take note of that fact and don’t add your name to such propaganda in the future. P.S. This Thursday, June 8, you have an opportunity to hear from experts at a briefing on Capitol Hill sponsored by Defense for Children International – Palestine & American Friends Service Committee. Congressional Briefing: 50 Years of Israeli Military Occupation & Life for Palestinian Children. Please plan to attend or send a staff person. UPDATE – June 9, 2017 – Response received from Senator Tom Udall. I wonder if writing to our elected officials in DC makes any difference. Thank you for your comments regarding S. Res. 176, a resolution commemorating the 50th anniversary of the reunification of Jerusalem. On May 24, 2017, Senators Mitch McConnell (KY) and Charles Schumer (NY) introduced S. Res. 176. Upon introduction the bill was referred to the Senate Committee on Foreign Relations. On May 25, 2017, the resolution was passed out of the Senate Foreign Relations Committee and placed on the Senate Legislative Calendar under General Orders. On June 5, 2017, the resolution was passed in the Senate by a vote of 90 to Zero, with my vote in favor. I value receiving feedback from my constituents, and I appreciate your taking the time to keep me informed. Your help allows me to more effectively represent you in the U.S. Senate. Thank you again for sharing your thoughts with me. Please feel free to contact me with your concerns regarding any federal issue by visiting my website at www.tomudall.senate.gov. For more information, you may also visit my Facebook page at https://www.facebook.com/senatortomudall and receive up to the minute updates through my Twitter page at http://twitter.com/senatortomudall. USS Liberty – when will the US Government tell us what happened? This morning I told an American friend about Israel’s attack on the USS Liberty in international waters in the Mediterranean on June 8, 1967. She was incredulous. I don’t blame her. It’s difficult for me to believe that Israel would deliberately attack an ally’s well-marked ship by air and sea for several hours. In fact, I would chalk such allegations up to anti-Israel-bashers if the USS Liberty survivors weren’t coming forward and sharing their eye-witness accounts. Their website provides convincing testimony and is very compelling. I also found this article — A Juridical Examination of the Israeli Attack on the USS Liberty by Lieutenant Commander Walter L. Jacobsen, JA GC, USN — published in 1986 in the Naval Law Review to be very credible. At the time, there was very little information about the attack published in the US mainstream media. 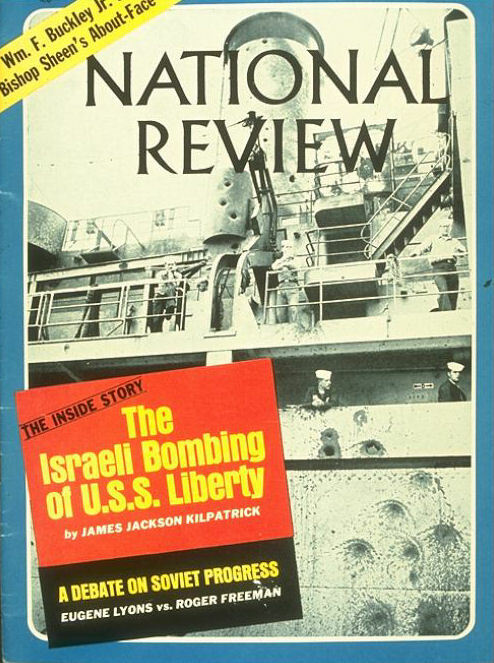 It’s safe to say that most Americans were hearing about Israel’s military superiority in the Six Day War (June 5 – 10, 1967), but not a peep about the death of 34 US Navy personnel on the USS Liberty. The National Review was the only American press to include a piece. As far as I can tell, the New York Times never covered the story in 1967 or after. No mention of the USS Liberty in the New York Times pops up until 1988. A letter to the Editor in the NYT in August of that year said justice still waits for the survivors of the USS Liberty. A few days later, Abe Foxman, the National Director of the Anti-Defamation League, wrote a letter defending Israel and calling the “unfortunate facts” a “tragedy” that cost lives. Unfortunately, Foxman’s facts don’t square with the eyewitness accounts. The chronology of events before, during and after the attack are spelled out here …. and leave only one question unanswered. When is the U.S. Government going to come clean with Americans? We deserve the truth.